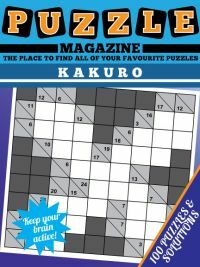 Our Irregular sudoku puzzle magazine, also referred to as Jigsaw Sudoku, has 100 all new irregular sudoku puzzles for you to enjoy. This puzzle is one of the more common and more fun of the various sudoku variants. 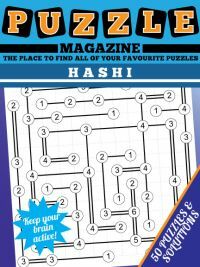 One of the most enjoyable elements about it is that there are many possible grid types, and therefore each of these presents a different set of regions and therefore a different puzzle each time. 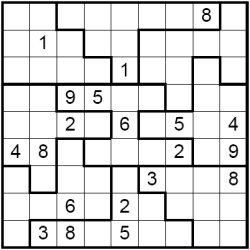 The rules that you use in standard sudoku certainly apply, that there is 1 - 9 once in each row, column and in this case irregular shaped thick lined set of nine cells. However, there is one rule that you will find yourself using a lot more than in normal sudoku and that is region intersection elimination. The key to solving jigsaw sudoku is of course to make the most of the shapes of the regions. Those that spread across a particularly large number of cells in another region (intersect over those cells) are particularly useful. Let's take a look at this in action. We can see that the '1' in cell Row three Column 5 (R3C5) means that cells 3,4,5,6,7,8 in row one cannot contain a 1. This only leaves three cells in row 1 that can contain a 1, but in fact cells 1,2 can't either because there is a 1 placed in R2C2 which contains cells R1C1 and R1C2 in its boundaries. This only leaves one cell that can contain the 1 in row 1, and that is the final cell, R1C9, and we place it there. Looking out at the start of the puzzle for applications of this can be the key to placing values quickly in jigsaw sudoku and making the appropriate eliminations as a result. 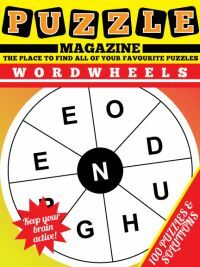 You will tend to find that you need to use pencilmarks a lot more with jigsaw sudoku than you do with normal sudoku (unless you are doing a particularly hard sudoku that relies on you going through and noting down each candidate for a particular cell systematically to reduce the options). 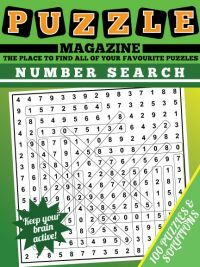 We can instantly place the '6' in row six using the simple logic above, and it pays dividends taking the time at the start of the puzzle to look for numbers that must go in a particular cell in a row, column or box. The 5 in row six can also be placed instantly. This will just leave 1,3,7 which must be placed in cells 4,5,6 in row 6 accordingly. With the 1 in column 5 and the 3 in column 6, this makes the candidates for those cells respectively: 137, 37, 17. This enables us to say that R4C5 and R4C6 must be 4 and 8, so we can mark 48,48 as the pencilmarks in those cells. We can eliminate 4,8 as candidates from all other cells in row four; this now means that the 8 can be placed in row five, in turn enabling us to place precisely the 4 and 8 in row four. 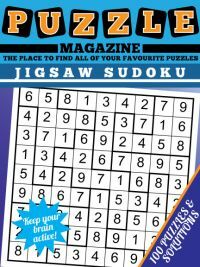 Now download the jigsaw sudoku puzzle magazine and enjoy 100 fun jigsaw sudoku puzzles.